Baseball is on! Let's watch others labor while we refrain from laboring. There are 16 games to choose from today, if you need to choose. 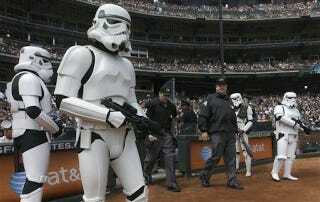 Unfortunately, it is unlikely that any will feature Storm Troopers as umpire escorts. That time has passed. Enjoy your holiday, and your baseball.